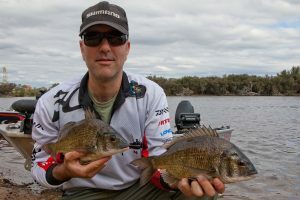 The Shimano Round 2 of the Atomic WA Bream Classic kicked in perfect conditions, with the start location moving from the Canning River to the new start location of the Maylands Scout Club, thus opening up the upper reaches of the Swan River and now making the Canning River an area to be included in plans and not taken for granted. Teams looked well stocked come the 7am start, with bacon and eggs rolls, some fabulous muffins from Granny’s Pies, and the ever reliable CRC gift. 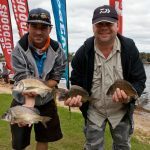 Making the most of the new start location was Team ‘Two in a Savages’ Szarn Tink and Graeme “from Belmont” Kovacevich weighing in four bream for 2.550kgs. 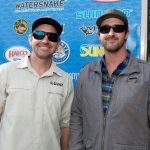 When asked how the day went Graeme replied “I guess it went to plan if we ended up in first place, but in honesty we did a pre-fish upriver and it was far from successful, so we sort of ruled that out. 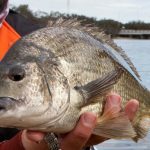 That left us with the plan of hitting a couple of spots downriver, before making the trek over to the Canning River and going through some of our regular haunts over there”. 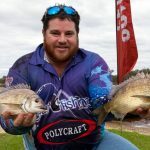 “We picked up our first two keepers around the Canning Bridge area, and these came on a Daiwa Presso hardbody. We then thought we would head right up the back of the Canning and see if we could find any more keepers, but all we found was rat city. 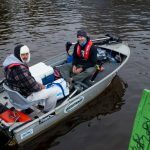 We did lose two fish but they could have been anything from undersize to whatever, we didn’t see them but it was just plain bad luck”. “Being all the way over in the Canning though we had to allow plenty of time to get back, and with the weather looking like it was changing we made the move out of the Canning. On the way out we hit a couple of likely looking dirty water spots, and they produced two cracking keepers of 37 and 38cm, these two fish all but made our bag what it was. They came on a ZMan 2.5” Grub in Bloodworm, these rigged on a Kietech 1/20th jighead. That was pretty much it, no upgrades or anything”. 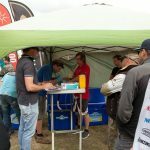 When asked if they had anyone to thank, Szarn replied “The lady who makes the bacon and egg sandwiches and the guys from WAFM for putting on another great event. Then of course Atomic and all the sponsors that make the events so good. Szarn used his trusty Berkley Dropshot rods each matched with a Shimano Rarenium 2500. 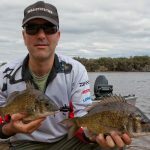 These were spooled with 8lb Sunline, whilst at the business end was a couple of metres of 5lb Sniper leader. Graeme used a Daiwa Battler which was matched with a new Daiwa Luvia 2506 reel, his second rod was a Nordic Stage Sharpshooter Rod matched to a Shimano Stella 2500. Each reel was spooled with 8lb Sunline whilst at the business end was 6lb sniper leader. 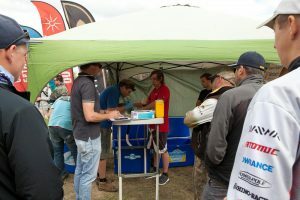 In second place was last year’s Team of the Year, Team Lowrance/Tackle Tactics Alex Griesdorf and Jack Dawson weighing in four bream for 2.340kg. 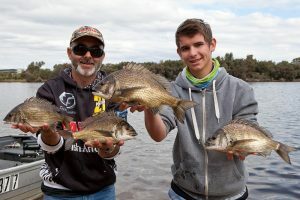 When asked how their day had gone, Alex replied “It was a good day out, we caught plenty of fish and had a good plan, which was to try and fish a mixture of flats and structure in both the Swan and Canning Rivers. 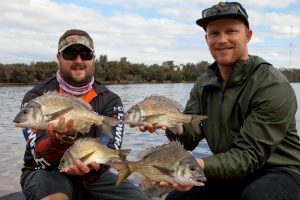 We found fish almost straight away bagging out by about 8.30am, then we thought that if we wanted our best chance of good upgrades, we would need to get away from the crowds”. 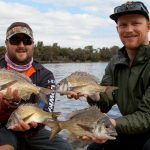 “So we decided to head up the Canning River, it was probably the one move that paid the most dividends for the day, especially since it was where we nailed our biggest upgrade as well as two others. It turned our run of the mill bag into something a little more competitive. So we were very happy with the move we made. All of our fish came on Zman 2.5” grubs in motor oil, bloodworm and suicidal rooster”. When asked if they had sponsors to thanks, Alex replied “certainly have to thank ZMan/Tackle Tactics for the awesome soft plastics, they just keep producing the goods time and time again and Daiwa for the great rods and reels I have been fishing with. Also a big thank you to my sponsors Lowrance for the top quality electronics that I use on my boat. Alex used a mixture of Dawia Battler Rods whilst Jack used Dancing Bream and Duff Rods, these were all matched to Daiwa Certate and Luvius reels in the 2506 sizes, they stuck with 3lb and 6lb leaders from Sunline and Yamatoyo. asked how their day went and whether it went to plan Joseph replied “we didn’t really have a plan as we only decided to enter at the last minute, so as a fall back I went through my fishing log books and found the area’s that were fishing good last year and on similar tides. So we decided to head up and give those a crack. It was probably about an hour into the day when we started the discussion of whether to make a move downriver, pretty much straight away we hooked out first keeper and this came on a Flash J Shad in Motor Oil. 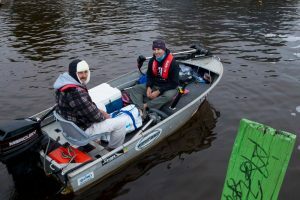 So we thought we would continue what we were doing, 10 minutes later I picked up another keeper, so we were certainly happy with how things were panning out”. “It was roughly about 30 minutes when Dror picked up our 3rd keeper, so we kept plugging away looking for our 4th keeper and hopefully an anchor fish. Pretty soon I hooked our best fish of the day on a Dragon Maggot, so to finally have our bag was pretty satisfying. We could then go on the hunt for a couple of upgrades, but the further we went upriver the crappier the water looked and it seemed lifelss. 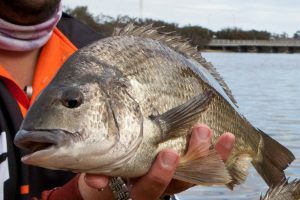 So we decided to head down river and see if any of the area around Maylands would give us any joy, and that was a fruitless exercise, we hooked one more keeper for the day but that didn’t upgrade any of our bag, but we were quite content with what we had on what felt like a tough day. In hindsight we probably should have gone back over the patches of fish we did find, but hindsight is exactly that, should’ve and could’ve”. Joseph used a Phenix Maxim rod and a Daiwa Edge Rod, both matched to Daiwa Luvia and Daiwa Fream reels, these were both spooled with X8 Jigging Braid, whilst at the business end was the ever popular Yamatoyo Harris Fighter leader in 6lb. 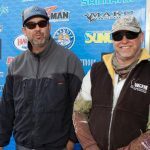 Dror and Joseph both fished a Texas rig and variations of that rig in 1/16. 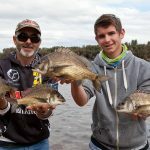 Joseph wanted to thank his and Drors sponsors in JML Anglers Alliance and Searing tackle, these two companies produce some quality bream gear for the Australian market and are well worth checking out. Taking out the Engel BIG BREAM for Round 2 was Team Lowrance/Tackle Tactics Alex Griesdorf with a nice Blue Lip that dragged the scales down to 945 grams and eclipse the 915 and 910 gram fish that Joseph Gardener and Graeme Kovacevich brought to the scales. 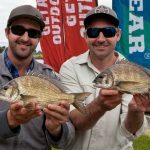 The top 3 placegetters all held the hot seat for the Engel BIG BREAM at one stage throughout the weigh-in. Top effort! 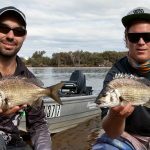 The Atomic WA Bream Classic Series would not be possible without the fantastic support of the tackle industry. 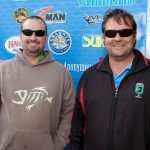 A big thanks goes to Atomic/Samurai from Frogleys Offshore for being the 2016 series sponsor, as well as all our various other sponsors such as Engel, CRC Industires, Tackle Tactics, JML Anglers Alliance, Mako Sunglasses, Damiki/Pontoon 21, EJ Todd and Son, Watersnake, Recfishwest, Platypus, Shimano, Anglers Anonymous, Bluewater Tackle, Halco, Tackle HQ and TheLurePro.com. Without your support our series would not be possible. sonic tags, this was a major operation and took nearly four hours to operate on 17 or so fish. 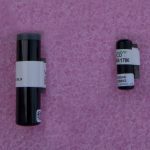 These tags are actually inserted inside the stomach of the fish and will relay data to DPAW receivers located throughout the Swan and Canning rivers. It was great to have these researchers along and also fantastic that the fishing community could help them out in their needs. The data that will be collected should be very interesting and we all look forward to seeing the results in the months to come. 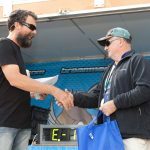 The events are great fun, with plenty of cash and prizes to go around including $100 random draw gift vouchers from some of our great sponsors and of Course the Engel Big bream cash payouts. 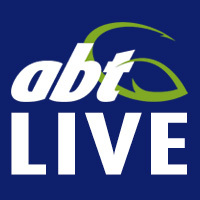 We look forward to seeing you at one of the next events.